BMW Group Innovation Day 2012: Efficient Dynamics. With the Efficient Dynamics development strategy, the BMW Group assumes a leading role in the entire automotive industry. The whole fleet in focus: the BMW Group continues to develop Efficient Dynamics and is working on innovative technologies. The BMW Group’s Efficient Dynamics family of engines: development of a completely new family of three, four and six-cylinder engines, equipped with BMW TwinPower Turbo technology. Predictive Power Management: Using navigation data, the power unit learns to “see” – already standard equipment on the new BMW 7 Series. Intelligent Energy Management: heat pump, infrared heating surfaces and the second generation of the air vent control help to save energy. Since 2007, the BMW Group has had an extremely successful concept for the reduction of fuel consumption and emissions at its disposal – the Efficient Dynamics development strategy. Efficient Dynamics is an integral part of all areas of vehicle development. Simultaneously, the BMW Group is relentlessly driving forward the electrification of its power units of its future vehicles. However, in the medium term, the internal combustion engine will remain the underlying technology, and thus the standard drive unit, for future series of volume production vehicles. The goal is to continuously reduce the fuel consumption of all the BMW Group’s vehicles. Completely new family of the BMW Group’s Efficient Dynamics engines featuring BMW TwinPower Turbo technology. Against this background, the BMW Group decided to develop a completely new family of engines. On the one hand, the existing high-tech concept of TwinPower Turbo technology will be used more effectively while on the other hand, the new engine family will enable an unsurpassed degree of commonality. The latest member of this new generation of engines is an advanced 1.5 litre TwinPower Turbo engine, which will be introduced next year. 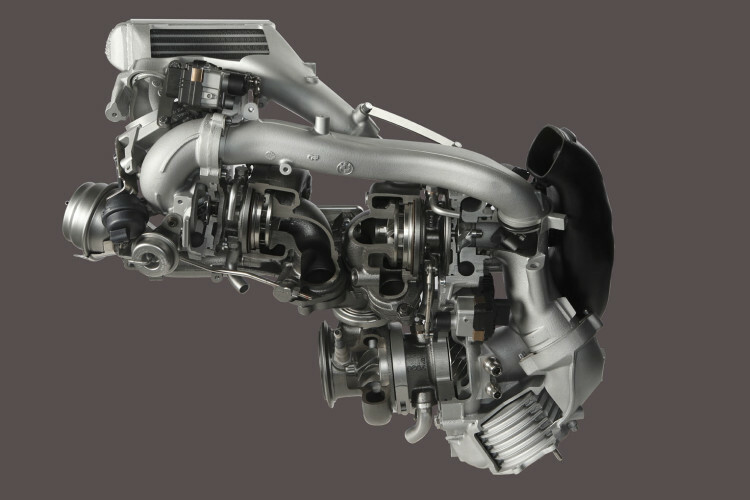 Today, BMW TwinPower Turbo technology is used in petrol and diesel engines of various powers and capacities. These engines enjoy the highest level of recognition, acclaimed by both customers and the world of professionals. Numerous prizes and awards testify to this fact. Recent examples include the four-cylinder petrol unit available in 1.6 and 2.0 litres, as well as the top-of-the-line, six-cylinder diesel power unit, the 3.0 litre diesel with Tri-Turbo charging. BMW TwinPower Turbo technology combines variable load control, direct fuel injection and turbo charging, specifically configured to suit each individual engine. Thus both efficiency and dynamics are increased in equal measure. An important feature of the petrol engines is the VALVETRONIC variable valve control system. Comparable to a highly efficient dimming system, it works almost entirely without losses, controlling all of the cylinders simultaneously and ensuring that extremely low fuel consumption and emission values are achieved. In addition to the gains in efficiency, it also noticeably improves the responsiveness of the engine. With the introduction of the new Efficient Dynamics family of engines, TwinPower Turbo technology has become the common feature uniting all of the brand’s petrol and diesel engines. The high degree of commonality, a term which refers to the large number of identical components within the engine family, ensures ongoing, sustainable development of the full range of power units. In addition, the BMW Group has now created the conditions necessary to be able to offer even more body derivatives in future. The new engine concept will allow considerable savings to be made in development, integration and production, at an increased level of quality. The new family of engines is based upon optimised cylinder modules, each with a capacity of about 500 cc, designed for thermodynamic efficiency, smooth, quiet operation and high-enjoyment – perfect for powering passenger vehicles. With the new three, four and six-cylinder engines, the BMW Group provides a range of engine capacities from 1.5 to 3.0 litres, thus adequately servicing a model portfolio consisting of very large volumes. This new family of engines celebrates its premiere with a turbocharged three-cylinder engine of 1.5 litres. The compact in-line engine has the same genes as the six-cylinder and impresses with its remarkable smoothness. The BMW Group has rounded out its range of engines in a unique way, adding a member at the bottom of the hierarchy. The new modular engine system exhibits a high degree of commonality between the petrol and diesel engines. Overall, the number of identical parts used in engines powered by the same type of fuel climbs to 60 percent, while the level of structural similarities between petrol and diesel engines is around 40%. Because in future, petrol and diesel engines will be produced on the same production line for the first time, the production process itself will be significantly more flexible. Predictive capabilities optimise the vehicle. Efficient Dynamics combined functionality to be put to even better use. Some examples of these technologies, of great benefit to the customer, are the Predictive Power Management system and the coasting feature, with the Foresight Assistant. The automatic transmission is given the gift of sight. The new Predictive Power Management system enables the automatic transmission to “foresee” the route ahead. The electronics utilise data pertaining to the route, drawn from the navigation system, to optimize the transmission control enabling it to deal with the driving conditions ahead. The transmission is aware of a bend in the road, even before the driver has taken his foot off the accelerator, and automatically selects the right gear. The vehicle can negotiate the bend under a light load and accelerate out of it far better. ECO PRO mode with Foresight Assistant. The new Predictive Power Management system also supports an extremely economical driving style when ECO PRO mode is selected. The Foresight Assistant makes the driver aware of deceleration situations in good time, in order to avoid inefficient braking manoeuvres and to reduce fuel consumption. Other efficiency measures include coasting, where the engine is decoupled from the powertrain, and the ECO PRO Route feature, which calculates the most fuel-efficient route for the driver. Efficient Dynamics saves energy throughout the vehicle. Under the general heading of “Intelligent Energy Management”, technicians at the BMW Group are working on a variety of individual solutions that reduce energy consumption. In battery electric vehicles (BEVs) or cars using plug-in hybrid technology (PHEVs), every kilowatt of stored energy (in this case as electricity in the battery) that can be saved by selectively operating ancillary systems, will be available to the electric motor for propelling the vehicle. Some of these techniques for reducing energy consumption are also applicable to vehicles with conventional internal combustion engines. The heat pump: heating energy savings of around 50 percent. A particular challenge in BEVs and PHEVs is the efficient delivery of the required heating capacity to heat the passenger compartment. If only energy from the battery were to be used for heating, this drain of electrical energy would greatly limit the range of the vehicle. By using a heat pump in these types of vehicle, around 50 percent of this electrical energy or even more can be saved, depending on driving conditions. The extension of range which is gained can be up to 30 percent, when the outside temperature is at freezing point, depending on the driving cycle. Infrared heating surfaces emit “healthy” radiant heat. Conventional heaters and air conditioners today heat the air inside the vehicle, which then transfers its heat to the driver and passengers. In contrast, in systems employing infrared heating surfaces, energy is converted into infrared radiation, which then warms the occupants’ bodies directly. The heating effect is operational only one minute after the system is switched on. In addition, the heat generated by infrared heating surfaces is distributed without any need for drafts of air and is completely silent. In the field of vehicle heating systems, modern infrared heating surfaces are a new solution that not only promotes low power consumption but also provides a noticeable improvement in the passengers’ level of comfort. Particularly when used in battery electric vehicles (BEVs), which are purely electrically-driven, in future infrared heating surfaces will yield gains in efficiency, since the electrical energy will be used to directly warm the occupants. Apart from rapidly warming the passengers, infrared heating surfaces can be used as an additional feature to create an agreeable, cosy climate within the vehicle. Separate regulated circuits, analogous to seat heating, with which the occupants can individually set their own degree of comfort are another possibility. Since each passenger can be provided with his own individual heating system, it is also possible to selectively heat only those seats that are occupied and thus reduce energy consumption. The new second-generation air vent control is variable. Back in 2003, the air vent control was already being fitted as standard equipment to several models, as a part of the Efficient Dynamics strategy. The system, which is positioned between the cooling air intake and the radiator, operates with movable slats, which can be closed if necessary, thereby improving the aerodynamics of the vehicle. With the second generation of this technology, a number of positions can be set in order to better control the flow of cooling air in an even more flexible, demand-controlled manner. The upper air slats are normally closed and when in this position make the largest contribution to a reduction in aerodynamic drag. Overall, the air vent control system reduces the drag coefficient cW by 0.015. Optimising the operating temperature of an internal combustion engine. In conjunction with the navigation system, predictive thermal management helps maintain the temperature balance within the engine, by means of predictive thermal conditioning of the coolant. The engine’s power delivery is improved and thermal operational reliability is further optimised. Energy management is an area of growing importance. Intelligent Energy Management is an integral part of the BMW Group’s Efficient Dynamics strategy. The goal of saving energy in all of the vehicle designs and the details of all of the automotive components has high priority, both now and in future. 2. Introduction: Efficient Dynamics – leading the field for years. Trumps the competition with reduced fuel consumption and enhanced dynamics. Since the spring of 2007, the BMW Group has had the most comprehensive concept for the consistent reduction of fuel consumption and emissions at its disposal – the Efficient Dynamics development strategy. As the world’s most successful manufacturer of premium automobiles, BMW has taken the lead in introducing innovative technologies that support the responsible use of natural resources. Back in 2000, sustainability was defined as a key corporate policy. Since then, the Efficient Dynamics strategy has become a guiding principle in all areas of vehicle development. The pillars of this development strategy include fuel-efficient combustion engines and transmissions delivering a particularly high level of efficiency, the continuing development of the BMW ActiveHybrid technology, innovative concepts for electro mobility as well as intelligent lightweight engineering and optimized aerodynamics. At an early stage, the BMW Group placed great confidence in its pioneering technical innovations and has now developed into the world’s most sustainable automobile enterprise. The goal is to reduce the consumption and emissions of every new model compared to its predecessor, while at the same time delivering increased performance. BMW TwinPower Turbo technology, optimised efficiency transmissions, ancillary equipment controlled on an “as needed” basis and the introduction of the Auto Start Stop feature – also available in vehicles with automatic transmissions – are at the heart of the solutions BMW provides, raising overall efficiency to new heights. In addition, measures such as brake energy regeneration, air vent control, gear shift indicator, electric power steering, as well as reduced rolling resistance tyres, contribute to reducing fuel consumption even further. Thanks to Efficient Dynamics, vehicles bearing the BMW and MINI badges set the standard in terms of reduced fuel consumption across the world for premium segment vehicles. At the European level, fleet consumption was reduced by significantly more than 25 percent between 1995 and 2008. The BMW Group is the only manufacturer to not only have met the self-imposed commitment made by the Association of European Automobile Manufacturers (ACEA) back then, but also to have exceeded it. In total, over the last 15 years the BMW Group has reduced the CO2 emissions of its European new vehicle fleet by approximately 30 percent. At the beginning of 2012, the range of BMW and MINI models consisted of 73 vehicles with CO2 emissions of no more than 140 grams per kilometre, including 30 BMW models with emissions not exceeding 120 grams per kilometre (07/2012). The BMW Group has announced that it intends to reduce CO2 emissions worldwide by a further 25 percent by the year 2020. 3. BMW Group Innovation Day 2012: Efficient Dynamics. 3.1 The New BMW Group Efficient Dynamics engine family – technologies powering the future, new engine family with 1.5 litre BMW TwinPower Turbo engine. BMW ActiveHybrid technology and innovative concepts for electromobility. As a technology of the future, the BMW Group is relentlessly driving forward the electrification of its vehicles, and yet still sees great potential for conventional engines. Therefore, in the medium term, the internal combustion engine will remain the BMW Group’s underlying technology and will thus power both existing and future series of volume production vehicles as the standard drive unit. Today, the BMW Group already has at its disposal a high-tech concept in the form of TwinPower Turbo technology. Building upon this, the BMW Group developed a completely new family of engines, to even more effectively take advantage of this approach and to create an unprecedented degree of commonality. The market launch of further advanced drive units will take place the coming year. The first member of this new generation of internal combustion engines will be an advanced three-cylinder unit. BMW TwinPower Turbo technology, which today is already fitted to many petrol and diesel engines and which in the course of time will be available for all new engines, occupies a key position in the on-going endeavour to reduce both consumption and emissions. The term “TwinPower” designates the compelling combination of variable load control on the one hand and the latest fuel injection technology on the other. The intelligent, regulating technology modules include the (double) Vanos infinitely variable camshaft control system, the VALVETRONIC variable valve timing system and the variable turbine geometry of the diesel turbochargers. These are complemented by the High Precision Injection direct fuel injection system for petrol engines and the Common Rail direct injection system for diesel units. The third element of this high technology concept consists of turbo-charging. This allows a BMW TwinPower Turbo engine to be charged with a single turbocharger, dual turbochargers, a twin scroll turbocharger or with a triple turbo unit. An essential feature of these engines however, is the VALVETRONIC throttle-free load control system, which sets BMW TwinPower Turbo technology conspicuously ahead of its competitors. Unlike a conventional load control system using a throttle valve, VALVETRONIC responds to the driver’s power requirement by varying the valve lift, which results in systemic efficiency gains. VALVETRONIC: fully variable valve lift on the intake side. VALVETRONIC, the variable valve control system, is an innovative technology for the throttle-free load control of petrol engines, which the BMW Group has deployed to great advantage since 2001. This system, available exclusively from BMW, has been continuously improved and represents the perfect solution for the engine modules of the future. The latest generation of the VALVETRONIC system employs a high-precision mechanism with an eccentric shaft to vary the valve lift on the intake side. Since the change in valve lift is infinitely variable, the usual throttle valve can be dispensed with during normal operation of the engine. The result: because the regulation of the required air mass takes place within the engine itself, the throttle losses in the charge cycle and thus the consumption can be reduced to a minimum. The engine is now more responsive, since in contrast to engines with conventional load control, throttle-free operation ensures that ambient pressure is nearly always present at the intake valves and thus the time necessary for filling the intake manifold with fresh air is eliminated when the driver needs more power quickly. A proven concept with a great future: don’t switch it off – dim it. BMW technology can be used in engines of different sizes and power. In a nutshell, these new engine modules put the BMW Group in a position to configure engines of an optimal size, providing an ideal solution for each individual application. The new family of engines with the 1.5 litre BMW TwinPower Turbo power unit. Since BMW TwinPower Turbo technology can be integrated into engines of all capacities and any number of cylinders, it is the ideal system for the future Efficient Dynamics family of engines. One of the first members is a 1.5 litre BMW TwinPower Turbo engine. This compact in-line engine possesses all of the renowned characteristics which unite all BMW power units and is distinguished by a high degree of dynamism and efficiency. The characteristics typical of a three-cylinder engine are also much in evidence – high-revving characteristics, spontaneous responsiveness and a dynamic, sporty sound. Excellent consumption figures thanks to lightweight, compact, low-friction design. The 1.5 litre BMW TwinPower Turbo engine enjoys significantly reduced fuel consumption by virtue of its low internal friction. Due to the long ignition intervals, the charge cycle can be particularly well adapted to suit the needs of the driver, providing a high “low end torque”, as well as a rapid response. To this end, the new three-cylinder uses the latest generation of the High Precision Injection direct fuel injection system and the VALVETRONIC variable valve control system. The “half of a six cylinder” runs remarkably smoothly. The vibration characteristics are every bit as impressive as the unit’s lightweight and compact dimensions. In this respect, the three-cylinder engine shares a number of common features with the six-cylinder in-line engines – neither of them generates free inertial forces nor free moments of inertia. The three-cylinder engine is also free of first and second order inertial forces and the roll torque, which is very small compared to the six-cylinder engine, is completely eliminated by the use of a balance shaft. Thanks to its torsional vibration damper, which works on the principle of a centrifugal pendulum, the engine behaves immaculately even at low rpm, providing an extremely comfortable ride. The three-cylinder sound – emotional and dynamic. In addition to the high-revving characteristics and gratifying responsiveness, the emotional sound of the engine also makes an important contribution to the driving experience. Because the frequency of the sound of a three-cylinder engine increases 50 percent faster than that of a four-cylinder, the engine is perceived as being extremely vivacious and sporty. The new family of engines in detail. Efficient Dynamics family of engines, this technology becomes the common characteristic of both types of engine, with three, four and six cylinders. Through the targeted development of additional components that can be used both for petrol and for diesel units, the BMW Group is steadily increasing the number of identical components within the family even further. In this way technical solutions in both current and future versions can be used on all of the engines, regardless of the number of cylinders, combustion method and power. The BMW engine module system maximises synergies. 30 and 55 kW (at 60 – 80 Nm) in the case of the petrol engine, while the diesel develops between 20 and 45 kW (at 75 – 110 Nm). High degree of commonality between petrol and diesel engines. The structural similarities between the petrol and diesel engines include the distance between cylinders, the aluminium crankcase, the balance shaft design, the arrangement of the timing chain, the layout of the cylinder head bolts and the high-quality coating on the cylinder bore surfaces. Overall, the number of identical parts used in engines powered by the same type of fuel climbs to 60 percent, while the level of structural similarities between petrol and diesel engines is around 40%. Even more benefits are provided by standardised interfaces. In addition to the identical engine mounting points, these are primarily the interfaces to the cooling circuit, the intake and exhaust manifolds and the heating and air conditioning systems. Compared to current models, the number of possible combinations in these areas has decreased by about half. Finally, all of the power units have the same “cold” intake and “hot” exhaust sides. This is why the three and four-cylinder engines in this new family are eminently suited to both longitudinal and transverse mounting in future BMW and MINI models. Decisive development, flexible manufacturing, premium quality. With the new modular engine, the BMW Group will in future be able to build three, four and six-cylinder power units delivering different levels of performance, each perfectly matched to its respective vehicle. This results in larger volumes, leading to significant savings in both development and production. In addition, the high degree of commonality facilitates the development of additional engine versions, which can then be realised economically at short notice, even in relatively small numbers. For the first time, petrol and diesel engines belonging to this new range can be manufactured together, at the same time, in the BMW Group’s engine production facilities. In this way, even short-term fluctuations in demand or new market developments can be addressed flexibly, with great success. The architecture for the new series of models and new engines has already been defined. With the BMW Group’s new Efficient Dynamics family of engines, it is also possible to provide for a wealth of new models of automobile in the coming years. Because theoretically, the new family of engines could provide ten ultramodern petrol and diesel engines with three, four or six cylinders, for vehicles with both longitudinal and transverse engine positions. striking a balance between more dynamics and less consumption, the transmission learns the art of foresight. Intelligently networked – Connected Drive meets Efficient Dynamics. (SPORT, COMFORT or ECO PRO); the vehicle responds with the desired driving characteristics. Predictive Power Management: the automatic transmission is given the gift of sight. The demands a driver places on an automatic transmission range from sporty and dynamic to extremely economic. BMW automatic transmissions already meet the different demands of the driver using various programs, which are selected on the Driving Experience Control. The transmission then shifts gears quickly and sporty, extremely comfortably or as economically as possible with early upshifts at low engine speeds. However this is always reactive, since its operation depends on accelerator pedal position and the driving resistance encountered, in line with the program that has been selected. It could be said that this system is driving blind. The new Predictive Power Management system, the result of relentless development activities, has now endowed the automatic transmission with eyes, with which it can “foresee” the route ahead. The Predictive Power Management system utilises data pertaining to the route, drawn from the navigation system, to optimize the electronic transmission control to deal with the road and driving conditions ahead. This advanced development promotes a dynamic driving style by delivering spontaneous response on the one hand, but also supports efficient driving in ECO PRO mode on the other. For instance, the transmission “sees” a roundabout ahead at a very early stage. The result: it shifts down automatically, the vehicle negotiates the roundabout in the right gear under a light load, and can then accelerate away far better on exiting. Pure dynamics: always in the right gear with Predictive Power Management. If the driver selects the Sport mode on the Driving Experience Control, the Predictive Power Management system uses the information supplied by the navigation system to implement a dynamic, vigorous gearshift strategy. So when the vehicle approaches a bend on a country road, the automatic transmission shifts down to the most appropriate gear on its own initiative and also uses the braking action of the engine if necessary. All of the shift operations will have been completed, just as the vehicle goes into the bend. The next bend in the road is detected and recognised as a following bend. The system identifies the radius of the bend and the transmission remains in the optimum gear. In this way, a higher level of drag torque can be readied when approaching bends. A greater amount of traction power is held in reserve, available for acceleration and unnecessary gearshifts and gear hunting in or between bends is avoided. This precisely-conceived strategy relieves the driver and enhances both ride dynamics and driving pleasure. The Predictive Power Management system works in a similar manner at roundabouts, crossroads and junctions. The Predictive Power Management system also reacts to turn signals, regardless of the course of the road ahead. ECO PRO mode: maximum efficiency at the touch of a button. In ECO PRO mode, a number of features are active which make savings of up to 25 percent possible, depending on the individual driving style. For example, the navigation system selects an ECO PRO route and informs the driver of the anticipated fuel savings. Upon request, the Foresight Assistant provides driving tips to increase efficiency even further. Additional features to increase efficiency are coasting, in which the engine and the drivetrain are decoupled and the vehicle rolls freely along, and the recording and evaluation of routes by the ECO PRO Analyzer. One of the advanced features of ECO PRO mode is the Foresight Assistant, which in conjunction with the Professional navigation system, provides timely information on the road ahead at an early stage and can give the driver tips on fuel-efficient driving, if so desired. These can be circumstances ahead that require a reduction in speed. The Foresight Assistant takes into account speed limits, bends in the road, built up areas, roundabouts, turns off of the route and motorway exits. An indicator on the instrument panel and/or the information display allows the driver to respond to these appropriately. The Foresight Assistant allows the driver to make the best use of coasting. ECO PRO coasting: moving rapidly along – with the engine idling. The new coasting mode enables the engine to be decoupled when operating in overrun, at speeds of between 50 and 160 km/h. As soon as the driver takes his foot off the accelerator pedal, the vehicle coasts, unaffected by the engine drag torque and with significantly less deceleration; the engine idles, fuel consumption is at a minimum. In this way, the kinetic energy of the vehicle – its momentum – is exploited and fuel savings of up to five percent can be realised by driving predictively, with the help of the Foresight Assistant. The coasting feature is indicated both on the instrument panel and on the information display but can be deactivated if so desired. A touch on the brake pedal restores the connection between the engine and the automatic transmission and the vehicle decelerates in overrun. Excess braking energy, if any, is recovered and stored in the battery. ECO PRO Route: the most economical route to your destination. In addition to calculating the fastest and shortest routes, the BMW Professional navigation system can also show the driver the most economical way to get to his destination. To take advantage of the savings potential the ECO PRO Route provides, ECO PRO mode needs to be selected. The system then presents an appropriate route, taking into account the current traffic situation and the profile of that particular stretch of road. The aim of this calculation is to reduce fuel consumption, while keeping the extra time required to an absolute minimum. This new system gives the driver the opportunity to weigh the extra time required against fuel savings and to make his own decision. The savings that can be achieved on each route are displayed as a percentage. In the event of traffic congestion, the system will suggest alternative routes. The individual driving style of each driver is the final factor which is taken into account when making the calculation. In order to achieve this, the system analyses the consumption behaviour of the vehicle in a variety of different driving situations. ECO PRO Analyser: knowing and showing what’s happening. The ECO PRO Analyser provides drivers with the opportunity to analyse their own driving styles, using the free BMW Connected App. With this app, a driver can transfer the data collected during his last few journeys quickly and easily to his iPhone. A star-based rating scale then shows him exactly how efficiently he has been driving. His driving style gains transparency, helping him to drive more consumption-consciously. ECO PRO Efficiencytainment: making saving a pleasure. Green Steering Wheel Prize in recognition of its package of measures to consistently reduce fuel consumption and emissions. 3.3 Intelligent Energy Management: heat pump, infrared heating surfaces, air vent control. The Efficient Dynamics strategy developed by the BMW Group reduces fuel consumption and cuts CO2 emissions while at the same time increasing performance by deploying a variety of technical solutions. In battery electric vehicles (BEVs), which are powered exclusively by electricity or automobiles using plug-in hybrid technology (PHEVs), the Efficient Dynamics strategy is aimed primarily at increasing the electric range. Under the general heading “Intelligent Energy Management”, technicians at the BMW Group are working on a variety of individual solutions that help to reduce energy consumption on board an electric vehicle or plug-in hybrid vehicle. Every kilowatt of stored energy that can be saved during the operation of the ancillary systems is available to the electric motor, enabling a greater operating range. Some of these new techniques can also be transferred to future vehicles with internal combustion engines. Efficiently delivering the required heating capacity to heat the passenger compartment at low outside temperatures is especially challenging when designing BEVs and PHEVs. The energy stored in the vehicle’s battery should, as far as possible, be used to drive the vehicle; the interior is heated with the help of heat pumps, a technology well-known in the domestic housing sector. To really take advantage of the higher efficiency of the heat pump compared to pure battery-driven electric heating, this technology needs to work reliably under all driving conditions. The principle of the heat pump remains the same. Like similar systems used for heating buildings, the heat pump in the vehicle uses ambient heat, in this case, the heat from the surrounding air. By means of an air conditioning compressor, the refrigerant is compressed and elevated to a higher temperature level. For use in vehicles, this technology needs to be able to heat, cool and also dehumidify the air in the passenger compartment. The existing refrigerant circuit has been extended to include additional components and regulators. In addition to the heat present in the air outside, heat originating inside the vehicle can also be used as a source; this process is controlled by an intelligent thermal management system which monitors the entire vehicle. Fifty percent of heating energy can be saved. fifty percent of the energy needed to heat the interior can be saved. Thanks to the “free” heat from the environment, the electric heater is required to contribute much less. The extension of range which is gained is between 10 and 30 percent, when the outside temperature is at freezing point, depending on the driving cycle. Use in conventionally powered vehicles is not currently under consideration. Infrared heating surfaces can help save energy. As an integral part of the Efficient Dynamics strategy, “Intelligent Energy Management” reduces energy consumption, especially in the ancillary systems of a vehicle. In the field of vehicle heating systems, modern infrared heating surfaces are a new solution that not only delivers low power consumption but also promises to make a noticeable improvement in the passengers’ level of comfort. Today, conventional vehicle heating or air conditioning systems heat the air inside the vehicle, which then transfers its heat to the driver and passengers. In contrast, in systems employing infrared heating surfaces, energy is converted into infrared radiation, which then warms the occupants’ bodies directly. Much like the heat from an open fireplace, the thermal radiation generated by infrared heating surfaces provides an extremely pleasant, cosy type of warmth, comparable to the healing warmth of an infrared lamp. When used in vehicles, electrically-powered infrared heating surfaces provide even more benefits. The heating effect can be enjoyed just one minute after activation, an important plus point in the winter. In addition, the heat is distributed without any need for drafts of air and is completely silent. Moreover, the heat output can be focused locally and very accurately. Theoretically, it is possible to focus the heating power solely on to the driver when he is travelling alone, in order to increase efficiency. From today’s perspective, infrared heating surfaces can be mounted in door panels, in the footwells and in certain areas of the dashboard. Practical uses of infrared heating surfaces in the future. Infrared heating surfaces could in particular conceivably be used to support conventional heating systems. Especially during the warm-up phase, the very rapid action of the infrared rays would be a great advantage. Separate regulated circuits, analogous to seat heating, with which the occupants can individually set their own degree of comfort are another possibility. Particularly when used in battery electric vehicles (BEVs), which are purely electrically powered, infrared heating surfaces confer efficiency benefits. Since no internal combustion engine is available to provide its waste heat, electrical energy has to be used in order to maintain the temperature of the interior of the vehicle at a comfortable level. The air vent control reduces aerodynamic drag. An Efficient Dynamics stratagem deployed at an early stage in a number of different models is air vent control. Air intakes to feed cool air into the vehicle always degrade the aerodynamics of that vehicle. The air vent control system compensates for this disadvantage by the use of movable slats, located between the air intake and the radiator. When the engine and its ancillary systems require a low level of cooling, the air vents close. Thanks to the improved vehicle aerodynamics resulting from this action, fuel consumption is reduced and unwanted external noise is minimised. The new, second-generation air vent control system is variable. Back in 2003, air vents were already being used behind the kidney-shaped grille on BMW 5 Series vehicles. Ever since 2007, the first generation air vent control system has been fitted to a number of different BMW models. Three different vent positions can be set using the three upper and two lower slats which are connected together, depending on the engine fitted to the vehicle. With the second-generation air vent control system, a much greater number of positions can be set in order to better control the flow of cooling air in an even more flexible, demand-led manner. Now, both the upper and lower slats are opened or closed to precisely-defined positions by an electric motor. The second-generation air vent control system also incorporates more perceptive sensing technology, which captures and evaluates more parameters than ever before. In this way, the temperature of the refrigerant, the air conditioning condenser, the transmission oil, the catalytic converter and the charge air feeding the turbocharger all benefit. Another important control variable is the speed at which the vehicle is driven. Clearly linked to driving situation. After pulling away at the start of a journey while in town, all of the slats remain closed to allow the engine and its ancillary systems to reach optimal operating temperature as quickly as possible. Once a greater degree of cooling is required, the lower slats open first, moving by an angle of 30 degrees. On the open road, the aerodynamics of the vehicle already play a major role. At low load, the air vents are gradually closed in a number of intermediate steps; during this process, the lower slats can also be opened, by 15 degrees only. On the motorway under full load and at high temperatures, a situation that demands maximum cooling performance, the lower slats can be opened completely, as can the upper slats to supplement them. The positioning of the slats in a number of discrete steps, in which the upper slats always open last and are always the first to close, is particularly important. Because when closed, the upper slats make the greatest contribution to reducing aerodynamic drag. Overall, the second-generation air vent control system reduces the drag coefficient cW by 0.015. Intelligent Energy Management in the hybrid drive unit. The BMW Group’s Efficient Dynamics strategy is single-mindedly aimed at saving energy. An additional field of activity for Intelligent Energy Management arises from automobiles powered by hybrid drives (HEVs) or plug-in hybrid technology (PHEVs). For these vehicles, BMW has developed a forward-looking operating strategy for the electric motor and the high-performance battery. Using an optimized charging strategy, the driving range achieved in purely electric mode is extended and it also ensures that the electric motor is mainly used where local emission-free operation is actually meaningful and desirable. For instance, the last few kilometres covered before reaching a destination in a city, or in a residential area. The more the control system “knows”, the better it can help. In future, the use of route information will not only be limited to the transmission control unit or to the charging strategy in the case of electric or hybrid vehicles. Basically, the better both the route and the driver’s requirements are understood – which also includes data on individual drivers – the better the various systems can be prepared to meet the challenges of the road ahead. Even today, it is easy to imagine that the entire thermal management system of a combustion engine could be predictively controlled. Predictive Energy Management: optimising the operating temperature of an internal combustion engine. Since July 2012, predictive thermal management has been fitted as standard equipment to the new BMW 7 Series models with six or eight-cylinder petrol engines and the Professional navigation system. When a destination has been set, the management system helps maintain the temperature balance within the engine by predictively thermally conditioning the coolant. Efficiency requirements to be delivered by the engine’s thermal management system, such as adjusting the highest possible coolant temperature or keeping a certain amount of cooling capacity in reserve for dynamic driving, can be recognised and met in a timely manner by analysing information on the current route in combination with other on-board data, together with the driving history. When the system detects that the vehicle is being driven through town, by means of a forecast of engine performance provided by the thermal management system, it can place the engine into its optimum operating state in terms of efficiency. For example, it will prevent the coolant temperature from sinking during short bursts of acceleration, such as when pulling away at traffic lights and when overtaking. If the system detects an incline, even as the vehicle is pulling away, the necessary cooling capacity will be readied in the cooling system in order to respond to the foreseeable change in the demand for engine power in a targeted manner. The predictive thermal management system thus makes an important additional contribution, enabling the engine to deliver power in a far better fashion, while ensuring the thermal reliability of the engine itself and all of the components located in the engine compartment. Intelligent Energy Management is already an integral part of the BMW Group’s Efficient Dynamics strategy. The goal of saving energy in all of the vehicle designs and the details of all of the automotive components has high priority, both now and in future. Networking the streams of data flowing throughout the vehicle still holds a great deal of potential. In future, many more predictive technologies and intelligent control systems will be making driving safer and even more efficient, under the motto “Connected Drive meets Efficient Dynamics”.